It’s now been almost four full 28 day treatment cycles with investigational PI3K inhibitor IPI-145 and it’s time for another CT scan (#4) tomorrow. This will be my third since August and they’ll be measuring my spleen, liver and many lymph nodes for shrinkage or reduction in lymphadenopathy as a result of the therapy. The key words I’ll be listening for from Dr Flinn afterwards will be Partial Remission or simply PR. 50% reduction across the board should be attainable from the numbers I’ve been watching and it would be an awesome Christmas gift! I’m winning, Leukemia is losing! After 3 1/2 28 day cycles of treatment in this ipi-145 clinical trial, The trends from my CT scans and CBC tests are all pointing towards more normal blood counts and hopefully a partial remission. 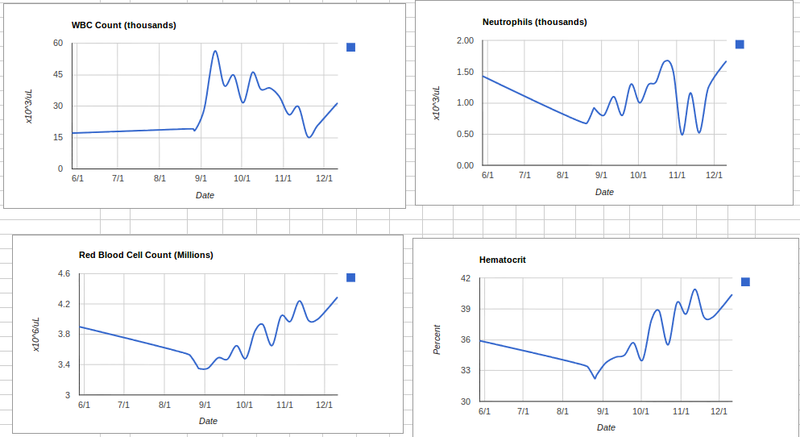 The WBC and Neutrophil counts show quite a bit of variability from week to week but they are trending in more normal directions. 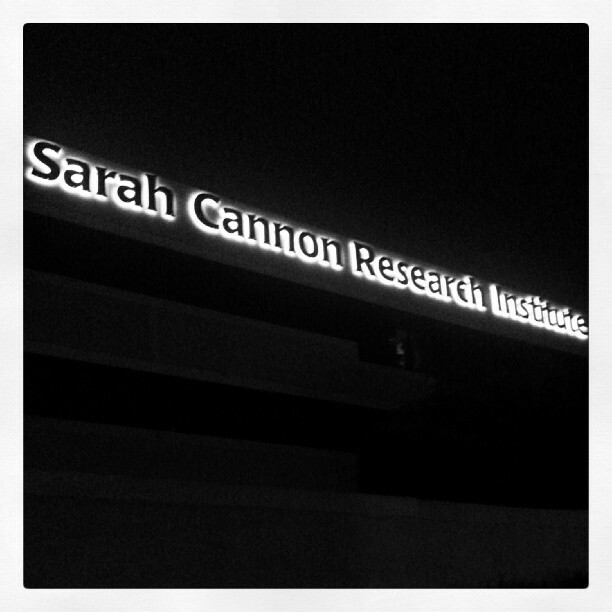 Can’t thank Dr Flinn and the team at Tennessee Oncology/Sarah Cannon Research enough. You can read the related article on OncLive. Disclosure: Dr Ian Flynn is my Oncologist/Hematologist and IPI-145 is the trial drug I take to manage my CLL. Feels like I’m part of an elite club. IPI-145 Data in Patients with CLL The presentation, “Preliminary safety and efficacy of IPI-145, a potent inhibitor of phosphoinositide-3-kinase-δ,γ, in patients with chronic lymphocytic leukemia” (Abstract #677), included 67 patients evaluable for safety and 47 evaluable for clinical activity. Among the 67 patients enrolled in the study, 52 had advanced disease and had progressed during or were refractory to, intolerant of, or ineligible for established therapy. An additional 15 treatment-naïve patients were enrolled who were age 65 or over or high-risk, defined as having 17p deletions or p53 mutations.Clinical ActivityUpdated data from the ongoing Phase 1 study showed that IPI-145 is clinically active in patients with relapsed/refractory CLL. 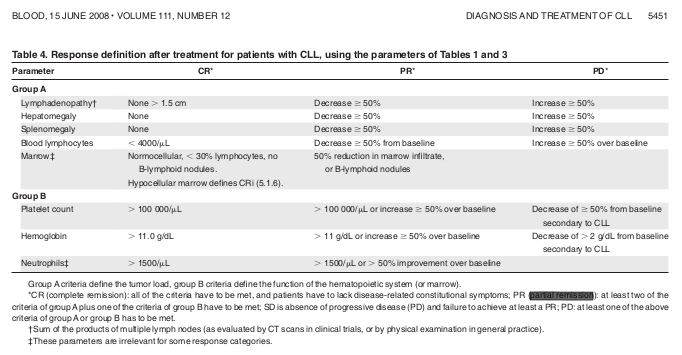 Treatment with IPI-145 at doses ≤ 25 mg BID in patients with relapsed/refractory CLL led to a nodal response rate of 89 percent and an overall response rate of 48 percent as defined by the International Workshop on Chronic Lymphocytic Leukemia (IWCLL) criteria1, including one complete response and 12 partial responses among 27 patients evaluable for response. The median time to response was less than two months. Seventy-five percent of patients (six of eight) treated for 12 months or longer remain progression-free on treatment.Among 12 patients evaluable with 17p deletions or p53 mutations who received IPI-145 at doses ≤ 25 mg BID, there were six partial responses, five patients with stable disease, and one disease progression due to Richter transformation. Patients with CLL with 17p deletions or p53 mutations generally have a poor response to chemotherapy and worse prognosis.2 Preliminary data in treatment-naïve patients showed a reduction in adenopathy in all six patients. Three of these six patients had nodal responses, including nodal responses in two patients with p53 mutations. 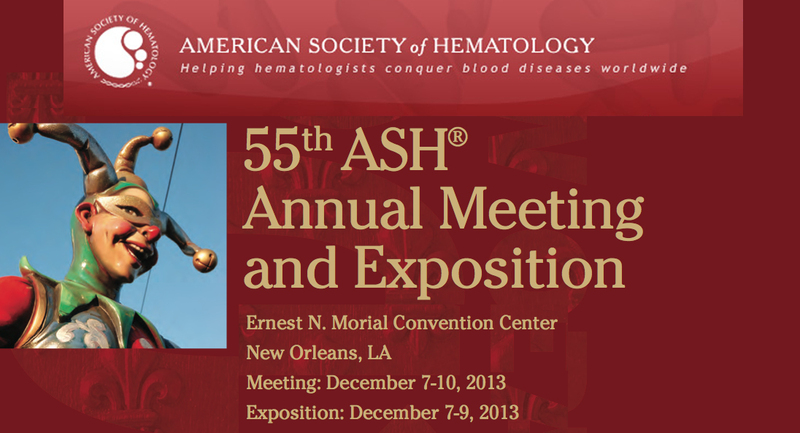 The ASH 2013 (American Society of Hematology) annual meeting kicks off in New Orleans today. There will be many presentations; this one I am most eagerly awaiting. It presents current data on the Infinity Pharmaceuticals ipi-145 clinical trial I am enrolled in. The presenter, Dr Ian Flinn is my Hematologist/Oncologist. You can read the full abstract here. Here’s a tidbit. Clinical activity has been observed in R/R CLL pts at all doses of IPI-145 studied from 8 mg to 75 mg BID and in pts with R/R high-risk disease (TP53 mut/17pdel). Treatment-related lymphocytosis is rapid, with the median ALC return to baseline within 6 cycles of treatment. Reduction in adenopathy occurs early with no apparent dose-dependence. 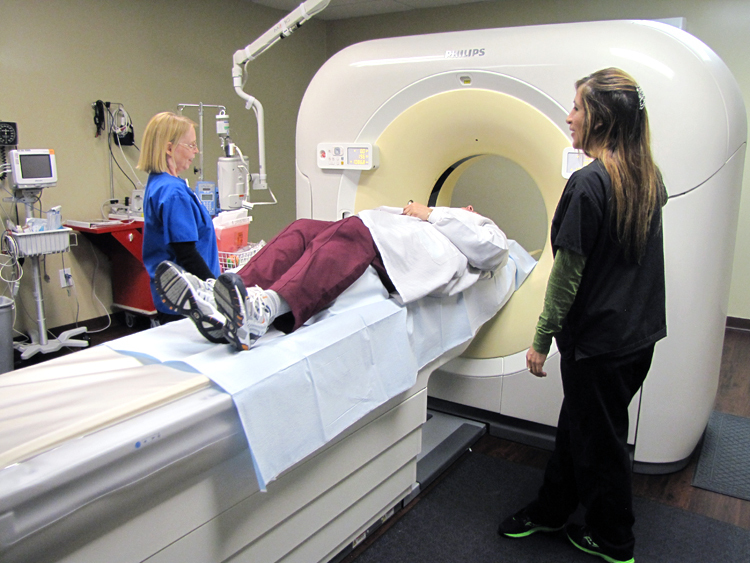 Nodal responses (>50% reduction in adenopathy by CT assessment) occurred in 79% of pts after 2 treatment cycles. Best overall response (based on investigator assessment per IWCLL) in evaluable pts to date (median [range] number of cycles 5.1 [1-21.1]) is 52%, with 1 CR, 15 PR, 14 SD and 1 PD. The ORR for the 19 evaluable pts treated at ≤25 mg BID is 53% (10/19; including 1 CR) and 7 of the 8 SD pts achieving nodal response. Resolution of lymphocytosis may lead to an increase in best ORR for SD pts who remain on study. R/R pts with high-risk disease (TP53 mut/17pdel) had similar ORR. Conclusions: IPI-145, an oral, potent PI3K-δ,γ inhibitor, appears well tolerated and has shown promising clinical activity in pts with R/R CLL across the range of doses examined. The PK/PD and clinical activity suggest that 25 mg BID is a biologically active dose in R/R CLL, and this dose has been selected for an upcoming randomized Phase 3 trial in R/R CLL. Updated data from treatment-naïve CLL pts who received IPI-145 at 25 mg BID and R/R CLL pts who received IPI-145 at 25 mg and 75 mg BID will be presented. I got this via email yesterday. It’s a lot of good information about making key treatment choices in a 20 min video. Now that I’m in my 4th cycle of the clinical trial, I don’t have to make weekly visits to the clinic. This is the first week since August that I’ve not had to go in to Sarah Cannon for labs etc. Every two weeks for cycles 4 and 5 and then monthly beginning cycle 6. Woot!! !